A statewide organization at the forefront of transgender-rights advocacy celebrated its 10th anniversary, marking the milestone with an awards ceremony and fundraising event. The theme of the celebration was “eXatic: Growing on 10years.” It was held on Thursday evening, Oct. 6, at Oberon, a theatre and nightlife destination in Cambridge. What a difference ten years has made for the Massachusetts Transgender Political Coalition. A decade ago, its first fundraisers were bake sales and ice cream parties. This year’s event drew more than165 people and was expected to raise more than $10,000, according to Nancy Nangeroni, chair of MTPC’s steering committee. In a first for the organization, MTPC honored two people for their contributions to improving the quality of life for transgender people. Moffet is no stranger to MTPC. In 2002 she assisted the organization in lobbying Boston City Council to pass a transgender-inclusive non-discrimination ordinance and has continued to lend expertise in current efforts to pass statewide transgender civil-rights legislation. Cambridge was the first municipality to enact trans-inclusive non-discrimination protections. Ordinances in Amherst and Northampton also provide similar protections. In brief remarks, Mottet said, “Because I work at the national level, I get to tell the rest of the country about the wonderful work you are doing.” Mottet was referring to MTPC’s community-organizing capabilities in drawing 200 to 300 people to Beacon Hill for lobby days, suicide prevention resources, and the ground-breaking “I AM: Trans People Speak,” a multi-media campaign aimed at raising awareness about transgender diversity. MTPC also presented its Community Innovator Award to Jesse Pack, who works at AIDS Project Worcester and also co-chairs Worcester Pride. In 2008 Pack created the Transgender Emergency Fund (www.tgemergencyfund.org), a first-of-its-kind organization to provide financial support for low-income transgender people. An all-volunteer effort, TEF has distributed more than $26,000 of direct assistance to those in need, primarily grants to pay rent and utilities. There is evidence of the need for emergency funding. A recent study by the Williams Institute at the UCLA School of Law found that 15 percent of transgender residents in Massachusetts live on less than $10,000 a year, compared to three percent of the general population. In other words, the poverty rate for transgender persons is five times that of the others. The Williams Institute report, based on a 2009 National Transgender Discrimination Survey, also estimated that the increased poverty rate may well cost the state as much in $2 million in lost tax revenue because of discrimination in employment and education, let alone millions of dollars of public assistance expenditures for housing and health care. To remedy the situation, the Massachusetts Transgender Political Coalition has advocated passage in the Massachusetts Legislature of a bill that would add “gender identity and expression” to the state’s civil-rights laws, outlawing discrimination in employment, housing, education, credit, and access to public accommodations. The measure would also expand the state’s hate-crimes statutes to include transgender-related offenses. Currently, the bill is in before the Joint Committee on the Judiciary, with MTPC pushing to have the measure brought before the House and Senate for a vote during the legislative session, which runs into 2012. Gov. Deval Patrick has said he will sign the bill into law. State Rep. Carl Sciortino, D-Medford, a leading co-sponsor of the bill, attended MTPC’s celebration. Also in attendance was gay-rights activist Tom Lang, co-founder of the grassroots advocacy group KnowThyNeighbor.org. 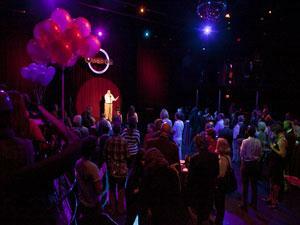 Be the first to comment on "MTPC celebrates 10 years of transgender advocacy"